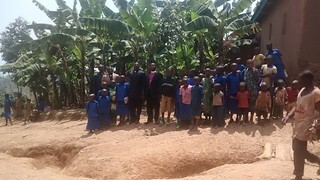 Bishop Emmanuel of Rwanda writes: “There are five churches which are being built in the Diocese of Rwanda. You have also the photos from Congo and Burundi. I stand with many but the one in clerical shirt is a Canon Missioner who is serving and helping many people, including priests. The other remarkable people are Steve Young and his wife, Elizabeth, who were visiting Cathedral Church of the Holy Spirit, CEC in Kigali. They were sent by Father James King, Rector of Church of the Holy Spirit, Portland, Maine,USA.